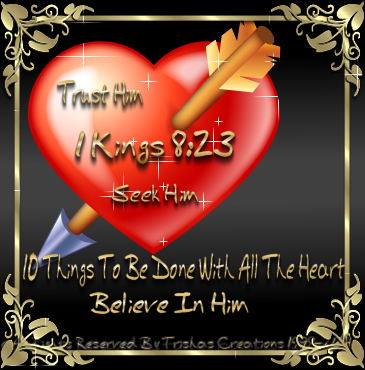 "10 Things To Be Done With All The Heart"
Welcome to "10 Things To Be Done With All The Heart"
There is so many things we can do with our hearts, and it is a shame that there are millions which decide to do nothing but harm to their hearts and hurt other's. But, the "10 Things" I have listed are good things which we can do with our hearts, and I have listed the Scriptures and the "Topic" in hopes that this will help you along your way. When we give God our hearts, we give Him our hurts, our cries, our loneliness, our children and our families, our grandchildren. We give HIM US! We give Him, us in all we do and say, how we walk, talk, carry ourselves, our attitudes, our joys, our whole being. Because, God knows our hearts, and He knows whether our hearts are sincere in all we feel or think. I hope the Scriptures below will help you in your research and I pray that they will Bless you!